So for me, the Hemex model of having inherited coagulation issues appears to be true. CETP ” The protein encoded by this gene is found in plasma, where it is involved in the transfer of cholesteryl ester from high density lipoprotein (HDL) to other lipoproteins.” -“CETP SNP rs1800775 with higher LDL-C” (the bad one) – it leads to my taking 500mg of flushing niacin daily. F11 – ” TT genotypes for rs2289252 were associated with a significantly higher venous thromboembolism (VTE)”. “two SNPs, rs2289252 and rs2036914 in F11, appear to independently contribute to the risk of deep vein thrombosis (DVT), a contribution that is explained at least in part by an association with FXI levels.” This is why I take Piracetam on a regular basis (Inhibitory effect of piracetam on platelet-rich thrombus formation in an animal model.) and Turmeric Modulation of transcription factors by curcumin. In short, if you dig into your REDs you will often find supplements that will mitigate your DNA risks. You may also find some that you should not take because while they help others, your DNA is different. The reds are the most important — but the yellow ones should also be reviewed. How does this test compare to Hemex’s? I assume Hemex’s is much more expensive, but if someone does just Livewello’s, will it be comparable, worse, better, or just different? First, Hemex was purchased by big Pharma when Dave Berg retired. Hence it may be a moot question. IMHO it is a little different and I am working on creating an expanded panel on coagulation SNPs — which being driven by current (i.e. 2014, 2015) pubmed articles would in theory make it better. Dang it, so it sounds like what you’re saying is that the Hemex test is no longer worth doing? It was something I was thinking about because after several months of taking 7 capsules of bromelain, grape seed extract, lumbrokinase, serrapeptase, and nattokinase, my blood stayed thick, sed rate the exact same number. I forget what, but it was below 5, probably 3, iirc. After this, my doctor decided he didn’t want to do sed rates on me anymore (worrying about medicare getting suspicious, I think), so, running out of money, I gave up on this aggressive anti-coagulation protocol. Is it normal for sed rate to be so stubborn? Anyway, now I just take a couple teaspoons of tumeric and don’t know if it’s helping or not. I see. What a shame. Well, what do you think of my results? Several months on all those anti-coagulants to get no change in my low ESR reading? Great work! Hope you don’t mind but we will be re logging this. 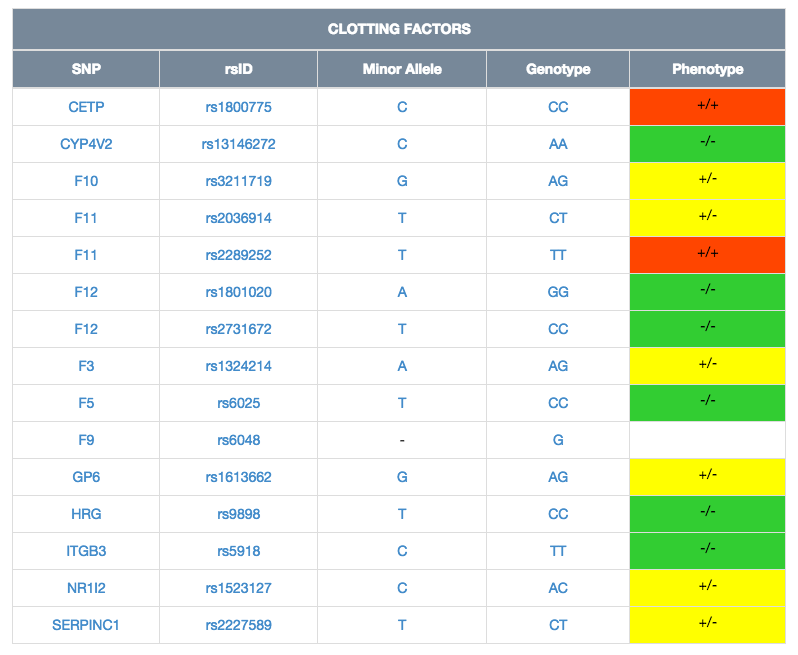 Just do you know, you can delve further into learning about even more clotting Genes because you get much more that just a 300 SNP variance report with your Livewello Gene App. Your App will give you your Gene report for a further 600,000 SNPs and attaches 8 resources for learning to each Gene. This is because we think you should have all the information in your Raw Data not just some of them. That way, you and your Heallthcare Practitioner can have the benefit of all this information when creating your treatment plan. Basically, as long as a SNP is in your Raw Data with rsID and Minor Allele, this App will generate your Gene Report for it. Remember to research further using these free tools that are included in your App.